I LOVE chicken wings. Good ones at least. There’s a lot of bad chicken wings out there. Ones that are all bones. Ones that are so overdone that the meat is chewy. Ones with no flavour. Ones drowning in sauce. Ones that will literally sear your face off with their hotness but have zero flavour. These are a dry style buffalo wing that are baked, not fried but are still lovely and crispy with excellent flavour and just enough fire. Set your oven to broil and allow it to preheat. Cover a cookie sheet with aluminium foil and place a cooling rack on top of the foil. 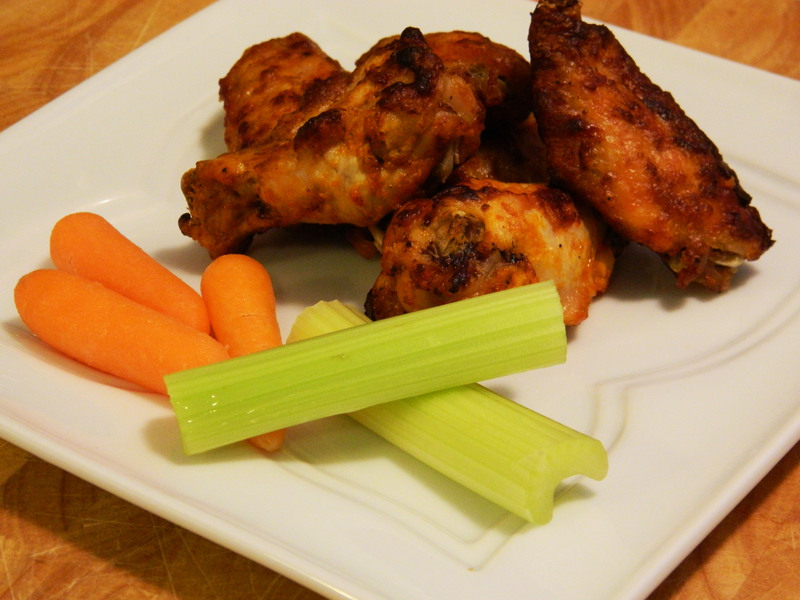 Season the wings well with salt and pepper. Melt the butter in a large microwaveable bowl. Add the hot sauce and stir. Add the wings and coat well. Place the wings on the cooling rack. Broil for 15 minutes on one side, flip the wings over, baste with additional hot sauce and broil for another 15 minutes. Remove, flip and baste again and place the wings in for another 5 minutes. Repeat process one more time for another 5 minutes.